The greatest children's book you've probably never read! Heiner Hertling painted over 50 original oil paintings for the book. He started with sketches, and then Robert Sams posed as a pirate to be the the model for the pages. Robert wore the same costume featured in the movie The Riddle in a Bottle. Laura and Robert worked with the crafty and talented Shawn Bowman to create these two craft books. 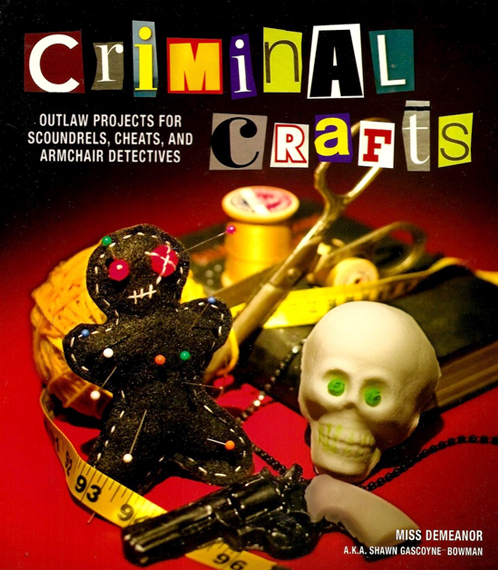 Crafters and mischief lovers alike will love Criminal Crafts, a book with 30 projects revolving around notorious criminals and their activities. From John Dillinger's soap gun to Bonnie Parker's gunshot poetry journal, readers will find themselves both amused and intrigued with the devious creativity. Not to mention how impressed party guests will be when they show up to Flaming Amy cocktails and cocktail bars stashed in violin cases. And just wait until you show off your shiv cozy! From the practical to the classically kitsch, Criminal Crafts are art projects readers will love.